(This product is discontinued. Using two 9410DA-2EO cards provides the capacity of the discontinued product here. Please see 9410DA-2EO for the replacement product.) The 9400-series Coax/Fiber transport cards provide a card-based solution for high-density distribution and multiplexing between discrete coaxial (“BNC”) signals (such as 3G/HD/SD-SDI, ASI, and MADI) and fiber buses. Utilizing the openGear® open-architecture platform, the 9400-series offers scalable incorporation and the easy-to use DashBoard™ setup and control operator interface. The 9400-series cards offer I/O crosspoints, allowing easy to configure and flexible routing between card inputs and outputs. Up to 10 of any 9400-series cards can be installed in our 20-Slot Frame, offering support for up to 40 BNC input/outputs and 40 fiber input/outputs in a single frame. In addition to SD/HD-SDI support, the cards support a wide range of signals/standards from 5 Mb/s to 3Gb/s. The scalability of the 9400-series offers a high degree of flexibility and density, maximizing economy of both space and costs. Full user remote and card-edge monitor/control allows full card status and control access locally or across a standard Ethernet network. 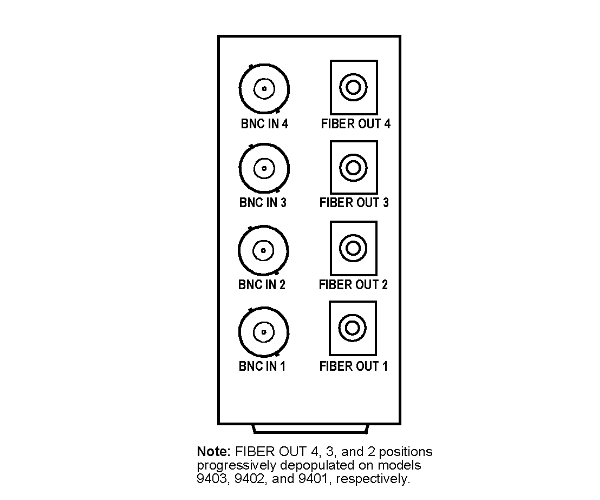 The 9404-EO offers E-to-O conversion with a 4x4 router crosspoint allowing any four BNC inputs to be routed to any four individual fiber output channels. Remote control/monitoring via DashBoard™ software, with soft-configurable crosspoint, EQ on/off, and reclock on/off. · (1) Rear modules for all models are equipped with four input BNCs which are cross-routable to the muxing Fiber Optic Module(s). 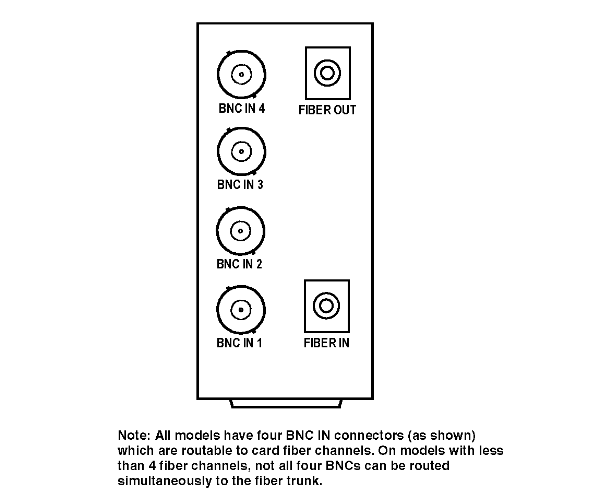 · (2) Use fiber wavelength codes for card Fiber Optic Modules (FOMs) when ordering. Available wavelengths (in nm) are as follows: 1270, 1290, 1310, 1330, 1350, 1410, 1430, 1450, 1470, 1490, 1510, 1530, 1550, 1570, 1590, 1610. · (4) Make certain when ordering companion OE (Receiver) cards that the same wavelength groupings are correspondingly also specified. You are currently requesting a quote for 9404-EO.